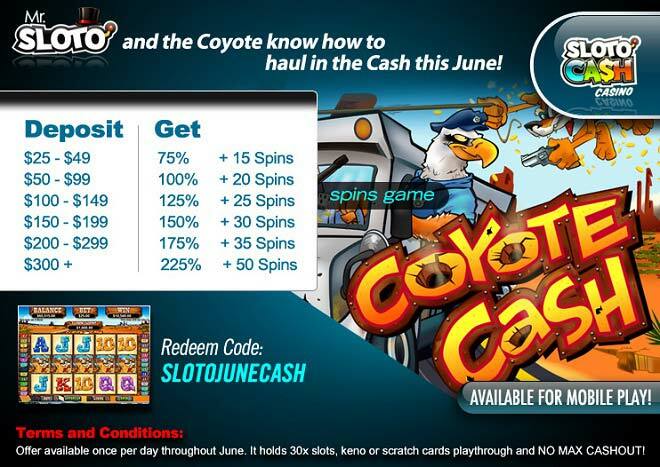 Mr. Sloto and the Coyote Bring in Cash this June! This June you’ll be hearing our own Coyote’s howl and Mr. Sloto ready to greet this wild creature as it brings in good luck and up to 50 Free Coyote Cash Spins when you deposit as little as $25! Land three or more Loots symbols and collect yet another 20 free games. And when you hit a Coyote symbol in a winning combination, your prizes will be doubled! But wait, June gets just a little better when you land the other winning symbols like a Rattlesnake, a Cactus, a Bull Skull, an Armored Van, as well as the poker card symbols of various colors! The howl of the Coyote leads the way for Mr. Sloto to help you collect up to 50 Free Spins when depositing a minimun of $25!